Was CNN’s Jim Acosta channeling Kinison during a recent press conference when he sparred with White House press Secretary Sarah Sanders demanding she denounce President Trump’s claims that the press is the enemy of his administration? If not, it certainly was reminiscent of Kinison’s badgering style–only not as funny. Is Jim Acosta right? Does Donald Trump hate the press? Does Trump believe the American news media a threat to his administration? To America? While Trump’s frequent accusations of “fake news” could cause one to wonder, in reality the answer is no, not exactly. First, Trump mostly lashes out at a select few in the press and typically only those employed by news organizations that have repeatedly exposed their flirtatious relationship with the yellow journalism of years past. The term yellow journalism was coined in the mid-1890s to characterize the sensationalism in reporting that some in the press used in the circulation war between Joseph Pulitzer’s New York World and Williams Hearst’s New York Journal. During this period, both papers were accused of sensationalizing the news in order to drive up circulation. An English magazine in 1898 noted, “All American journalism is not ‘yellow’, though all strictly ‘up-to-date’ yellow journalism is American!” Interestingly, both of these newspapers were Democratic and both sympathetic to unions and the issue of open immigration. Sound familiar? But in addition to the mainstream outlets resurrecting the practice of yellow journalism (tabloid news never abandoned the practice), primarily to drive circulation and thus their profits, members of the press seem to have developed a case of historical amnesia, unaware that most American presidents have been suspicious of the press, with more than a few downright hostile to it. So while Jim Acosta and his ilk may think Donald Trump is just being mean and picking on them, or even violating their First Amendment rights, perhaps a lesson on the history of the Oval office and the relationship to the press is in order. But during his presidency, Jefferson became critical of what he saw as the partisan nature of the news media and began airing his grievances in personal letters. In one he penned, “Nothing can now be believed which is seen in a newspaper. Truth itself becomes suspicious by being put into that polluted vehicle.” It’s worth noting that early 19th century papers frequently printed pieces with overt bias and plagued politicians with personal attacks. As history reveals, Jefferson was hardly alone. Theodore Roosevelt was also suspicious of the media. Much like Trump, Roosevelt was masterful at playing the press for his own gain. Although he would often refer to those in the media as “muckrakers,” he often used the press to his advantage. He would give reporters information on Sunday and then base his decisions on how the public reacted when the news was printed that following Monday. Many attribute the art of spin to Roosevelt, who often played the press by engaging in outlandish stunts to get their attention and the accompanying publicity. Woodrow Wilson loathed the Fourth Estate. So much so, he sought to have the entire industry censored, which he claimed was “absolutely necessary to the public safety.” While some historians claim Wilson’s concern was due to World War 1, this anti-press sentiment was revealed before the war days. In fact, Wilson did achieve a measure of his goal once the war broke out through war time censorship and propaganda. Harry Truman had a very strained relationship with the press. He accused the press of publishing unflattering photographs and printing false allegations about his political backing during the campaign. 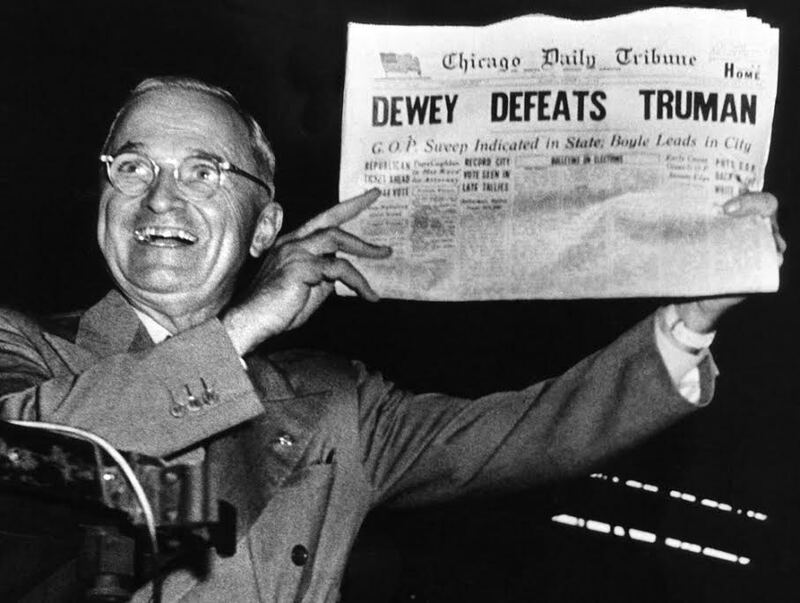 Perhaps the strain began in the moments after he was elected to office, when newspapers were emblazoned with the erroneous headline “Dewey Defeats Truman.” Prior to Truman’s victory, 50 political experts polled by Newsweek unanimously concluded: “Dewey couldn’t lose.” Jump forward 68 years…according to the experts, nor could Hillary Clinton. The list continues to include the likes of Richard Nixon and Bill Clinton, for obvious reasons. But what about the administration of Barack Obama? Would Jim Acosta approve of the Critical Information Needs study embraced by the previous administration? Also known as the CIN, the study was to be launched as pilot program in 2014 to study whether media outlets were best serving their respective markets. Under Obama’s plan, the US Government would monitor news and information to determine, and if need be, make recommendations of what critical need to know information should be included in news broadcasts, papers, and of course talk radio–the majority of which is Conservative. Of course the program was presented under the guise of serving the public interest and safety (similar to Wilson’s desires), but the study was met with immediate outrage from both sides of the political spectrum due to the obvious conflicts with the first Amendment and the possibility of being exploited for political reasons. Some even claimed it was a revised version of the pre-Reagan era Fairness Doctrine. Is Trump as vitriolic as previous presidents when it comes to the American news media? Comparatively speaking, history suggests he is not, In reality, his suspicions are as warranted as Jefferson’s, Wilson’s, Truman’s and others. Trump is, however, much more prone to publicly express his distaste and in a manner some find offensive. But as long as the news media is willing to subordinate balanced reporting to the attainment of profit, its members can expect to be on the receiving end of presidential suspicions and backlash for years to come.